Welcome to the Moore Rotary Club! 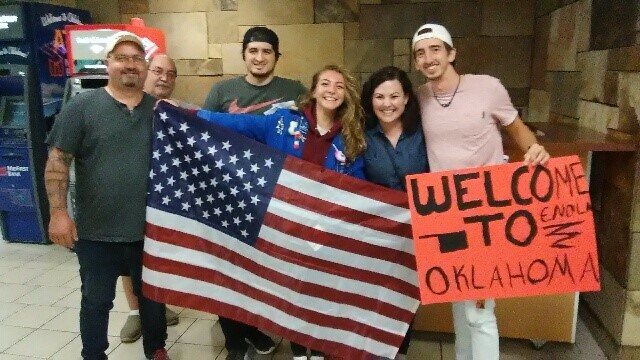 The community of Moore, OK is no stranger to tragedy and triumph through the tornados our community has endured and the outpouring of love and support provided immediately following these events. The Moore Rotary Club has a mission to give back to the community and the world that has given us so much. We know that our growth as a club will continue to strengthen our efforts to make our community and our world a better place. We welcome visitors to come check us out and hopefully we can join you with the 1.2 million Rotarians around the world making a difference. Welcome to the Moore Rotary Club! 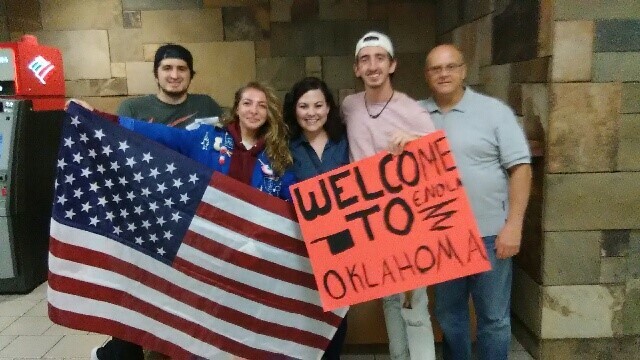 Late on Saturday, August 11, 2018, our club was at Will Rogers World Airport in Oklahoma City to welcome our Youth Exchange student from France to the United States. We look forward to sharing this journey with her, as she embarks on the best year of her life. Welcome, Enola! Donations Doubled to Feed Children in Moore! Food is the most essential school supply, yet one in four children in Moore faces hunger. You can help! You’re a business owner wanting to be involved in the community, help with philanthropic initiatives and generally give back. You’re also seeking the same opportunities for your employees. The Rotary Club of Moore Business Membership is a way to do both, while avoiding onerous time obligations on your busy schedule. Dean Martin, Louis Armstrong, and Michael Jackson are coming together for one night only to benefit the Education Services Committee! This fun-filled evening of music and laughter will be held at the Yellow Rose Theater on Thursday, February 23, 2017 from 6:30 to 9:00 p.m. featuring a variety show with songs that span the decades. In addition to wonderful entertainment there will be chances to win rockin’ prizes. Proceeds from the night’s event will benefit the projects of the Moore Rotary Club’s Education Services Committee. Please consider joining us for 90 minutes of fun at our “Bowling for Education” fundraiser on Tuesday, October 25 between 5:30-8:30 p.m. at Hey Day. A registration form with more details about the event is attached. First Ever Rotary After Hours! Join the five Rotary clubs in Cleveland County: Norman Noon, Sooner, Cross Timbers, Legacy, and Moore for an evening of fellowship and networking in the first ever Rotary After Hours! And two people will be going on a cruise as a result! Cleveland County Aging Services is working with the Moore and Cross Timbers Rotary Clubs to raise funds for senior services. To accomplish this, the two Rotary Clubs are holding a raffle for a $2,500 cruise voucher for two. Dean Martin, Louis Armstrong, and Michael Jackson are coming together for one night only to benefit the Education Services Committee! This fun-filled evening of music and laughter will be held at the Yellow Rose Theater on Thursday, February 25, 2016 from 6:30 to 9:00 p.m. featuring a variety show with songs that span the decades. In addition to wonderful entertainment there will be a live auction and chances to win rockin’ prizes. Proceeds from the night’s event will benefit the projects of the Moore Rotary Club’s Education Services Committee. As the 111th Anniversary of Rotary on 23 February approaches, I hope you will take the opportunity to spend the evening with some of your Rotary friends, men and women, to talk about Rotary, particularly the Foundation as it prepares for its centennial year in 2016-17.